The gaming room at MGM Springfield. SPRINGFIELD — Hanging conspicuously in the middle of the new MGM Resorts International casino here is a massive framed picture from 1888, showing every member of the Free and Accepted Masons Lodge, Springfield Commandery #6. It is a sea of stone-faced men with comically wild facial hair, an image that is at once fascinating and weird. And yet it fits the offbeat décor of the state’s first resort casino, which is brimming with appreciative nods to the city’s history and curious fragments from the past. It looks like no casino you’ve ever seen, as un-Vegas as Springfield itself. And that is exactly the idea. 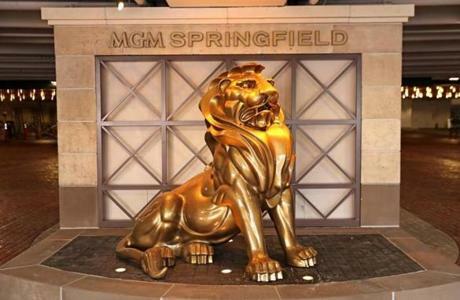 Seven years after Massachusetts legalized casino gambling, touching off a fierce competition among companies to stake their claim, MGM Springfield is set to open on Friday, marking the first time patrons can legally wager on table games such as blackjack and craps within Massachusetts. 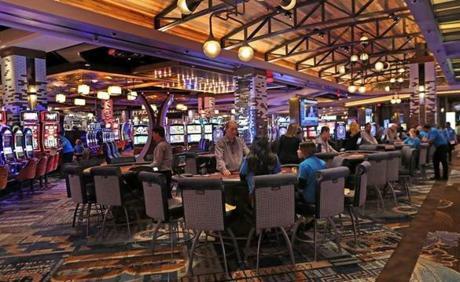 The casino will have 2,550 slot machines, 120 table games, and 23 poker tables, giving it a moderately-sized gambling portfolio, with about half as many slots as the gargantuan Foxwoods resort. 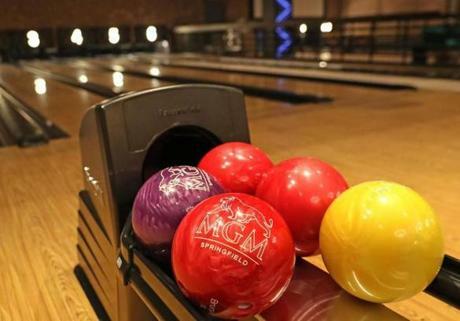 MGM’s gambling floor is surrounded by restaurants, bars, shops, a bowling alley, cinema, event space, and a 250-room hotel. The resort will employ nearly 3,000 people, about 35 percent of whom live in Springfield, according to casino officials. With the $2.5 billion Wynn Resorts casino in Everett not scheduled to open until next June, MGM Springfield will have a head start on establishing a customer base in Massachusetts, and provide a first look at the impact of a full-fledged casino on the area. Built in the city’s downtown just off Interstate 91, the casino is a high-stakes project for the Las Vegas company, which invested some $960 million into a development unlike any it has ever built. “It was not without cost and not without some risk,” said Bill Hornbuckle, president of MGM Resorts. For the long-depressed city known as the capital of Western Massachusetts, the casino opening has been anticipated for years as a new dawn, bringing money and energy to a chronically ailing downtown. An exterior view of the soon-to-open casino. “It’s going to bring very large numbers of people on a daily basis and that’s going to contribute to the overall atmosphere,” said Kevin Kennedy, Springfield’s chief development officer. Combined with the recent renovations to the city’s Union Station transit hub and a recent surge of construction of market-rate housing, “the ingredients are there for a long-term” economic revival, he said. “You are starting to see these pieces come together,” he said. 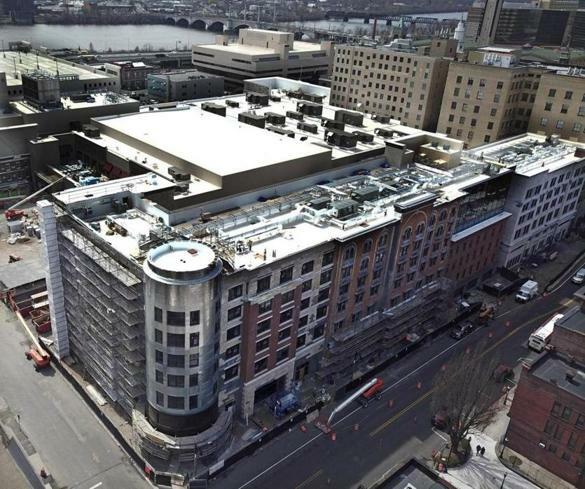 What makes MGM Springfield’s design unusual for the gambling industry is how the development blends into the existing streetscape of the city’s South End. 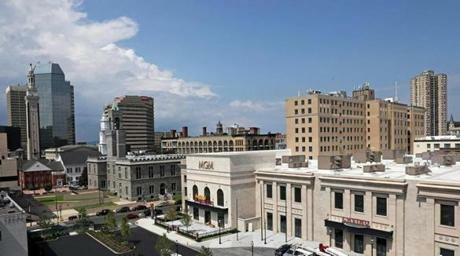 The casino used some existing downtown facades with new construction built inside and behind them. It doesn’t try to soar or gleam; it tries to fit in. The complex also has a dozen entrances, according to MGM, breaking from the traditional casino model that funnels patrons through the gambling floor to reach the hotel and amenities. Instead, the gambling floor is in the middle of the resort, surrounded by a ring of restaurants and shops. Diners could reach a restaurant, for instance, either from the casino floor or directly from the restaurant’s on-street entrance. A view of South End Market. “It will be unique and we think it will be meaningful in how the resort interacts with Main Street,” Hornbuckle said. A recent tour of the casino showed how designers went to great lengths to connect the décor of the project to Springfield and the region. It’s got an eclectic feel, unusual for the casino industry which often shoots for glitz and can tack toward tacky. MGM Springfield is full of old furniture and reclaimed pieces of bric-a-brac, many bought at the famous antiques fair in nearby Brimfield. A large 19th-century chandelier over the elevator vestibule came to Springfield from New York after MGM chief executive Jim Murren spotted it in an antique store, according to the company. 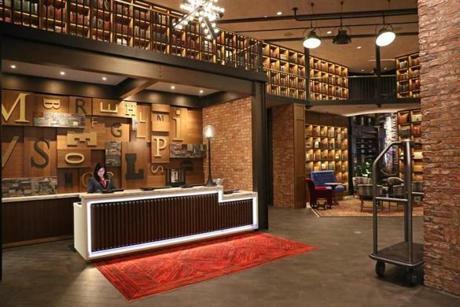 The lobby is packed with walls of books. Yes, books. Classics, books by local authors, even random school yearbooks. If you graduated from Agawam High School in 1969, your yearbook is here, full of handwritten notes and signatures from class members. The lobby of MGM Springfield. The resort also features scores of antique globes and countless old trophies from forgotten golf tournaments and other competitions. In one hotel suite, a tabletop of trophies includes the first-place prize handed out at a 1959 fishing derby in Point Judith, R.I. The hotel occupies five stories above the casino. No two hotel rooms are identical. Rooms combine a lot of dark colors and neutrals, exposed concrete ceilings, brass lamps and Edison bulbs, leather, and natural woods. Some suites have live-edge dining tables made from a tree that had stood on nearby Bliss Street. Decorative oddities, from small animal skulls to big brass keys, sit under glass domes. The feel is a little like a wizard’s workshop, and whether you like that sort of thing or not, it’s unusual and fresh for the casino industry. 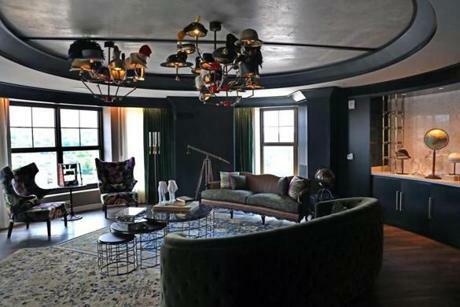 A view of presdential suite. The resort has a number of homages to Springfield native Theodor Geisel, the famed children’s author known as Dr. Seuss. Pillows and carpets feature quotes from Emily Dickinson, the 19th-century Amherst poet who published work in the Springfield Republican newspaper. Be its Pillow round. STEP lightly on this narrow spot! Will there really be a Morning? Merriam-Webster, the Springfield dictionary company, is represented with fat old dictionary books on stands, and wall artwork printed on dictionary pages. Old school chairs and a church pew have been repurposed in the casino’s food court. Outside, a castle-like 1895 National Guard armory is being turned into event space. 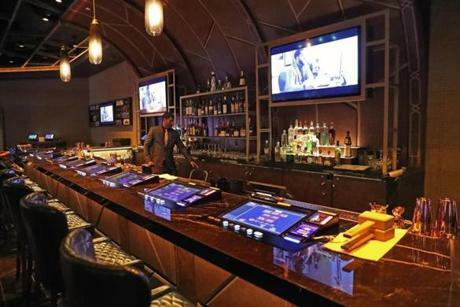 On the casino floor, the Commonwealth Bar, done in dark rich colors, was designed to look like “an old-style haberdashery,” said James Reyes, an MGM regional vice president who oversees night life. The drink menu will include the $25,000 “Indian sidecar,” which is made with a 117-year-old Croizet cognac, Grand Marnier Quintessence, fresh lemon, and a gold sugar rim. If that price seems steep, it also comes with a new Indian motorcycle shipped to your house. The Commonwealth bar & lounge with gaming screens at the bar. If the resort defies casino tradition in many ways, the gambling floor looks, well, like a piece of Las Vegas. It’s still an odd sight to see rows of flashing slot machines in Massachusetts, even though the Plainridge Park Casino, the Plainville slot parlor, has been open since 2015. The Massachusetts Gaming Commission controls one more casino license that is designated for Southeastern Massachusetts. That license has not been awarded, largely due to legal uncertainty over the Mashpee Wampanoag’s plans for a tribal casino in Taunton. While casino supporters have looked to the gambling industry as an economic spark, Les Bernal, the national director of the anti-casino group Stop Predatory Gambling, predicted that MGM and “other predatory gambling operators” will ultimately be shut down. It seems fitting that the state’s first resort casino would be in western Massachusetts. In the early days of the competition to enter the Massachusetts casino market, most of the action centered on the Springfield area. Casino executives were convinced, erroneously as it turned out, that Suffolk Downs and partner Caesars Entertainment had the Greater Boston license locked up. With the Southeastern license on hold, that left the west. Mohegan Sun planted its flag in Palmer. Hard Rock International tried Holyoke, then West Springfield. Even MGM miscalculated at first, flirting with Brimfield before moving on. Springfield Mayor Domenic Sarno changed the landscape by publicly signaling that the city would welcome casino proposals. Springfield quickly became ground zero for the industry’s rush to get into Western Massachusetts. Ameristar Casinos made a Springfield pitch, Penn National Gaming proposed a casino resort in the city’s North End, and MGM pitched its gambling and entertainment complex in the city’s South End. Sarno decided the city would hold its own competition and would send one proposal to the state Gaming Commission. Ameristar dropped out when it became clear city officials preferred a downtown location. MGM won the local contest, and Penn went on to open Plainridge. Springfield’s competitors were struck down by voters. Palmer residents defeated the Mohegan Sun proposal in a surprising result, and West Springfield voters nixed a Hard Rock plan. That left MGM the last proposal standing. It received its casino license in 2014. “It’s been a long six years,” Kennedy said. 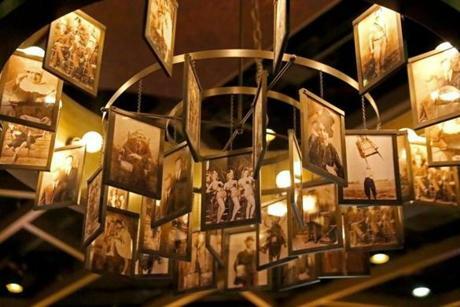 A chandelier in the Commonwealth Bar. Built in the city’s downtown just off Interstate 91, the casino is a high-stakes project for MGM, which invested some $960 million into a development unlike any it has ever built.